The process of creating materials has been implemented in a way that uses the current max workflow, materials are handled in the same way as you normally do inside max. For a review of the supported max material features, see the Scene Features page. Even when a huge set of max material features are supported, the preferred and recommended way of work with materials is with the new Ogre Material. 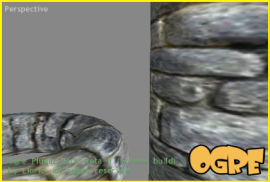 It gives the user full control over the ogre material creation, providing access to all ogre material parameters, and put the gpu shader power at the users disposal. This new material is integrated as a native max material, thus the user will be inmediatly familiar with it. Current scenes that contains max materials can upgrade to Ogre Materials automatically, while keeping those materials to be used by the max viewports and renderer, all this in a transparent way to the user. The new Ogre Material type is a very advanced, natively implemented max material. It gives the user total control over the material settings and attributes, implementing 100% of the ogre engine material specifications. The Technique Material represents a single ogre technique. A Technique is a method of representing geometry. Multiple Techniques are used in order to provide fallback approaches for different hardware cards that dont support the preferred Technique, or as Level Of Detail versions in order to improve rendering performance when objects are more distant. The TextureUnit Texmap represents an ogre TextureUnitState.